What is the Internet of Things and why is it a Security Threat? As more and more devices are capable of being connected to cyberspace, the Internet of Things will continue to expand. That could be good or bad, depending on how you look at it. In this blog post, we’ll focus on the security liabilities that come with increased connectedness. The Internet of Things, also known as the IoT, refers to the connection of devices (excluding computers, smartphones and other typical ones) to the internet. For example, coffee makers, lamps, wearable gadgets, alarm systems, smart cars or any device that can connect to the internet. Why is it a Security Threat? The main reason the IoT is a security threat is because of sheer volume. The more devices you have, the more opportunities cybercriminals have to infiltrate one. Also, many devices that are considered part of the IoT are not designed with cybersecurity in mind, making them easy targets for hackers. Ransomware, the malware that has seen frightening booms in prominence throughout 2016, is an ever-growing threat to IoT devices. While ransomware targeted at your computer locks you out of your files, ransomware that infects IoT devices can have different real world implications. Depending on the device it hijacks, the consequences can be dire. Businesses in particular are targets of IoT ransomware, since hackers know that shutting down critical business infrastructure will warrant a prompt response from the victim. In other words, hackers prey upon vulnerable companies, seizing their devices and demanding steep ransom fees in return. 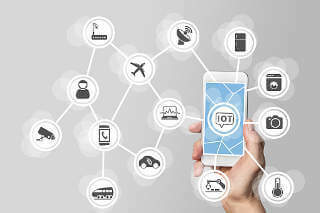 IoT botnets can be defined as groups of hacked, interconnected IoT devices that work together to send overwhelming blasts of data to internet servers. This effectively cripples the targeted servers, leading to widespread internet failures. Security experts have argued that these kinds of attacks can “take down the internet.” While this is a bit of an embellishment, the fact remains that botnet attacks pose a very real threat. Man-in-the-middle refers to attacks in which hackers intercept data being sent between two devices. The attacker can trick the recipient into thinking they are receiving a legitimate message, similar to the case of spoof emails. However, that message will steal even more of their data. Always using a safe wireless connection. Training employees on the importance of cybersecurity. Establishing a Bring Your Own Device (BYOD) policy if your business allows its employees to use their own equipment on its network. As manufacturers begin incorporating more effective security materials into the Internet of Things, threats will become less potent. But for the time being, always take the utmost caution.